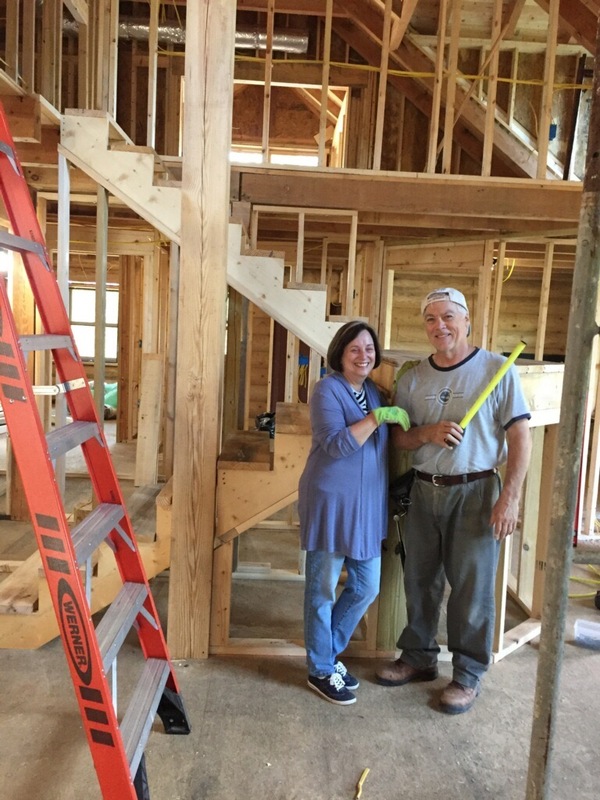 I’ve been helping a friend rebuild his log home in Pigeon Forge, TN – the original was destroyed by the 2016 fires. My project this week was a U-shaped staircase centered around a midway landing. A few weeks before the build, I developed a model in Google Sketchup and with the help of a construction calculator was able to design a plan to work from. Complicating the project was the fact that no finished floors were in place, so that meant we had to decide on the thickness of material to eventually use on the floors and the landing. Once that was decided, I punched the actual numbers into the calculator which helped determine the stringer layout. We cut the upper stringers and installed them, then calculated the thicknesses of the landing sub-floor and finished floor. From that I determined the height of the landing which we then built. Then it was a snap to run the lower stringers. We will eventually use oak stair treads and landing flooring, but for now we just installed treads from scrap lumber to be used while the other trades are still working. A real treat was seeing a bear at a house just below where we were working.